Water flossers are a revolutionary product for some people, not until you use them do you realise how great they can be. Using pressurised water to clean in between teeth and along the gumline, they offer a more gentle yet as effective (if not more so) clean than regular floss. With many, you have the option to control the pressure of that clean, for more comfort. Dominated by US brand Waterpik, which has for a long time been relatively unchallenged in the marketplace. But there are a few options worth taking note of and the H2ofloss HF-8 Whisper is one such example. What is the H2ofloss HF-8 Whisper Water Dental Flosser? This is a countertop water flosser produced by Chinese firm H2ofloss. Competing with the offerings from Waterpik, it offers a pressurised water jet to clean in between teeth and along the gumline. Taking water from a refillable on board tank, the pump inside the flosser takes that water and feeds it out through a nozzle on the handle of the flosser. The water jet that exits the flosser can be altered in its pressure and the angle of the jet adjusted too. Connected to mains power to be used and cannot be used wirelessly. It is a possible alternative to string floss with the water passing in between teeth and gums as well as under the gumline to remove plaque, bacteria and food particles. It can reach the 35-40% of teeth surfaces that do not get cleaned with regular brushing. Using a water flosser takes some practice and is not generally something you master first time you use it, but the skill and technique can be quickly learnt. Step 1: Fill the water tank/reservoir with lukewarm water (tank can be lifted out and replaced). Step 2: Fit the nozzle you prefer to the handle of the flosser ensuring it has clipped into place. Step 3: Lean over the sink and place the tip of the flosser into your mouth. Close the lips to leave just a small opening for excess water to drain from. Step 4: Press the power button to switch the unit on, water will begin to flow. Step 5: Slide the switch on the handle to increase the pressure until you are satisfied. Step 6: Aim water at the gumline at a 90 degree angle. Follow the gumline and pause briefly between teeth. Clean both upper and bottom teeth. Step 8: When complete, switch the unit off. Most dentists without exception will recommend interdental cleaning, or flossing as many of us refer to it as. The white string floss most of us are familiar with works and is particularly good at getting into tight gaps, but it is awkward. Interdental brushes are great, fitting in the larger gaps, but they can still be a bit fiddly. Water flossers on the other hand, whilst a little messy, tend to be much easier and quicker than traditional floss or interdental brushing, but the results are similar. Market leader Waterpik has shown how the use of water is actually more effective than floss. Ideally used in combination with regular flossing, water flossers can be a great appliance for those who simply fail to get in a habit and routine with more traditional methods. The HF-8 Whisper from H2ofloss is a superb value product that allows you to try such without massive expense. Here are a list of the pro’s and cons having used the WF-8 from H2ofloss. Pressure settings – 5 pressure settings to choose from (5-110 PSI). Box contents – Great number of tips included. Tip storage – A place to store the tips, complete with protective lid. Price – Fantastic value for money. Pressure settings – Bit fiddly to control via the brush handle. Noise – Perhaps not as quiet as you might think. Quality – Given what you pay little to complain about here, but perhaps not quite as good quality as Waterpik. The design of the H2ofloss water flosser is pretty typical of a product of this type. It is hard to be particularly innovative or inspiring, but the overall package is neat and tidy. There is the main unit, which is White in color and houses all of the electronics and mechanics that make the unit function. Made of plastic it is smooth to the touch. The unit has an overall ovalish shape design, with sweeping curves to the right and left side of the unit. On the front is the power button the handle and hose. The power button is a fairly large, pale Blue button, set off to the left side of the unit. More centralised is the handle to the water flosser. This sits in a little dock that holds the handle upright. This dock is Blue in color and is quite tight to actually sit the handle in. What I mean by this is that you have to be quite precise in your placement of the handle when fitting it back on the unit otherwise the handle may not sit in place properly. Waterpik have a bit more play in the holder, which means you need not be so focused when seating the handle back in the holder. The handle is White in color with a Blue colored power control slider and eject button. The slider is on the front of the handle, with the eject button to the left side. At the top of the handle is a circular hole, into which the provided jet tips fit. They push into this hole and clip into place. It is the eject button that releases the hold on these tips. The top of the handle can actually be rotated a full 360 degrees for finite control over the tip of the nozzle when in the mouth. The handle is rounded in its design and sits comfortably in the hand. The ridges on the slider make for easy gripping. Below this handle is a recess in the body of the main unit that allows the length of White colored hose that runs between the unit and the handle to sit. It curls up inside neatly, a little like a garden hose might on a reel. The upper half of the water flosser is made up of 2 user removable plastic units. They are a translucent clear colour. The larger of the 2 is the water tank, that holds 28oz/800 ml of water. This sits on the right side as you look at the unit. On the left side is the tip storage compartment that can hold up to 20 tips if they are all placed in together, or it can hold 7 in a more organised fashion if you make use of the provided divider. Both the water tank and the tip holder have a hinged lid over them to protect from dust and splashes. The back of the unit is free of any controls. Wired into the unit is the power cord. A 2 pin US adapter connects to the socket to actually power the unit. It is compatible with 110v power supply only and does not have support for international voltages. The power cord is about 55 inches/1.4 meters in length. Combined with the hose on the front of the unit, you have about 2 meters or so of stretch from the power socket to the sink that you need to floss over. So, to actually using the H2ofloss then. You first need to fill the tank. This is the largest reservoir I have seen on a water flosser to date. With a 28oz/800 ml capacity, you can get up to 3 minutes usage time from it. Depending on your technique this will give you 1 long cleaning session of for some 2-3 flosses without needing to refill the tank. A definite plus point here. Some have much smaller tanks, much to the dissatisfaction of some owners. The general recommendation is to fill it with lukewarm water. To do this, lift the water tank off of the flosser, under a tap for filling then replace it. In the base of this tank is a plastic plunger that remains closed, keeping the water in, until its docked back on the main unit. Some have reported this seal leaking a little over time meaning you get a trail of water from the sink to the flosser. Just be aware of it. I have not experienced this. If you want an added burst of freshness, you can add some mouthwash to the water, but its not essential. With the tank filled, connect the power adapter to the socket if you have not done so already. Select 1 of the tips and clip it into the top of the handle. Take the handle and bring it up to the mouth, positioning the tip inside the mouth. Create a seal around the tip, but with a slight gap to allow excess water to drain out. Lean over the sink when in use. To begin the water flow, press the power switch on the main unit to on and slide the Blue switch on the handle up slightly. The water will flow at a fairly rapid rate. Aim the jet at the gumline at a 90 degree angle, moving along the gumline and pausing in between teeth. Increase or decrease the pressure of the water jet by sliding the switch up to increase and down to decrease the intensity of the clean. There are 5 pressure settings varying from 5 PSI to 110 for the most intense clean. For those with sensitive gums, the low pressure feels lovely and soft, helped by the use of warm water too. Up to 1200 pulses a minute are delivered from the small hole at the top of the tip. The slider control is good, but it can be a bit awkward. I like the control is right there in your hand, but it does not give the same level of granular control as Waterpiks flossers. They tend to have the pressure control on the main unit. It feels easier to control and less likely to switch it to the wrong setting. Waterpik do too offer up to 10 pressure settings on more premium models. It’s not a big issue, but something to be aware of. Make sure you clean both upper and lower teeth thoroughly, including the back teeth. The length of the jet tip and the adjustable angle helps with this. It will take some practice if you have not used a water flosser before. Expect the first few goes to take longer and be a bit messier. After a few attempts you will have it figured out and get used to how best to move the tip, adjust the pressure etc. For finer control, you can twist the top of the flosser handle. This will turn the nozzle up to 360 degrees, so you can get into all the gaps and reach all areas of the mouth. This can be a bit fiddly in use and take some practice. I found myself using the other hand or the index finger to grip on the little ridges around the top of the handle to move the tip. I found the cleaning results to actually be quite comparable to Waterpik and other water flossers I have used. My testing has not been conducted in any way that might be considered clinical, so I cannot say with hard fact that it was better or worse, but it felt similar. Waterpik have invested in a lot of research and studies to perfect their product and prove their effectiveness. In fact, for many, the really impressive thing here is that the American Dental Association (ADA) have awarded Waterpik their Seal of Acceptance. I have not seen evidence to confirm such for H2ofloss. It is quite likely such data does not exist. However, I suspect the design principles and mechanics are very similar. Unless under test conditions observing the difference is really quite difficult in my opinion. To my teeth and gums it felt very similar and for the cost saving of H2ofloss, similar is good enough. Impressive is the number of tips included in the box, 12 to be precise. You will see it comes with nasal tips. I have not tried these nor will comment on them, I am interested in the dental elements, so of the 12 provided, 10 are of more interest to me. However, the 10 tips are not useful for all. The 4 x jet tips are for the average user. For those with teeth in generally good shape, no braces, no gum disease etc. The Periodontal tips have a design that makes them better for those with periodontal pockets and advanced stages of gum disease. Getting deeper within the gumline and into that pocket to clean out bacteria. Your dentist will advise if this is applicable to you. Brace wearers can take advantage of the orthodontic tips that have the addition of little brushes on the end to help clean the dental appliance and remove bacteria that might be lodged on and around it. The tongue cleaner is suitable for all. Often overlooked, cleaning the tongue reduces the bacteria in the mouth and the chances of bad breath. The design helps limit splashes and focuses on getting the clean to the tongue surface. Which tips are useful for you will depend on your dental health, but for the average user there is a lot of extra value here. Jet tips are normally good for about 6 months, whilst all others normally need replacing after about 3 months use. When you do need to replace them, they are cheap to do so. Coming in packs of 2, they work out on average $2.50 per tip or $5 for a pack. A nice touch is that the jet and tongue cleaning tips come in different colors which mean you can easily identify which tip is yours. For example if you share the water flosser with other family members, the tips can be changed each time. You need to remember you color only. The provided storage area for the tips is useful, particularly for families and is a nice touch. Few others come with this. It is worth noting, that this is described as a quiter water flosser with a noise around 50 decibels. I don’t think it is much quieter than most alternative products. It still makes quite a bit of noise, the pitch of the sound is different to others I have tried. I don’t want you to think that the unit is almost silent in operation. Overall the H2ofloss is very impressive and performs well. A few little quirks or issues aside, I would be hard pushed to tell this apart from the market leader. This might seem a little strange, but I am not entirely sure what the price of the HF-8 is supposed to be! Head to www.h2ofloss.com and the cost is 139 Singapore Dollars, which is about 105 US Dollars. Go to Amazon.com and the suggested retail price is $60 (US) but sells for $30 or just under. I could not see it listed on any other major US retailers website to make extra comparison. Although it might be nice to buy direct, buying from Amazon is actually the cheaper option. Interestingly, the seller on Amazon is H2ofloss, but it is fulfilled by Amazon. I believe the $60 might be to look comparable to Waterpik as many of their models are around this price. You can actually save best part of 50% though. That is a big saving and a very low price considering what you get. The unit comes with a 2 year warranty, but something we like to do at Electric Teeth is price the unit over a 3 year period, to try and give a rough calculation of what it would cost to own this unit over a few years, not just to buy it. What does need to be factored in is the cost of replacement tips. The H2ofloss comes with 12 in total out of the box, but not all will be suitable. For the sake of example, I am going to base this on 1 user, making use of the jet tip only. As a tip lasts 6 months, once the 4 that came in the box have been used, 2 more will be needed. At just $5 for a pack of 2, they are amazingly cheap at just $2.50 each. This means, that over 3 years, the H2ofloss HF-8 Whisper will cost $35 to own, which works out at $0.03 per day. Super low that price is. Premium brand Waterpik is typically twice this price. You can expect to pay $60 for a similarly featured Waterpik flosser and $10 for a pack of 2 tips. Good old string floss might be 1-2 cents per day, but for that little bit extra you get the convenience that comes with water flossing. If you can share with other family members, this will bring the cost down further. The standards of products available to buy today can vary considerably. However, for the most part many do exceed the basic standards we expect and the HF-8 is no exception. I have found the overall build quality to be good and in my weeks of testing experienced no faults or serious cause for concern. It is not the best quality and I believe if you were to compare side by side with more premium options you would notice a slight difference, but slight it would be. Electrical products are more prone to issue as there are more moving parts and electrical circuits that can fail. My hands on testing does not put the flosser though and specialist test other than everyday use. Others have commented online that there have been faults with the unit and it is not uncommon that some will fail. Failure points appear to include the mount for holding the handle/nozzle and the seal on the bottom of the water tank, it can leak a little when taking the tank from the sink to the unit itself. H2ofloss do provide a 2 year warranty should anything go wrong, which I think is fair. Very closely matched in terms features and performance to the market leader Waterpik, the HF-8 has surprised me at just how well it performs. It is not perfect, the are some concerns over the build quality and there isn’t the trust and peace of mind that comes from the brand leader. However, the price is a minimum of $20 less and that is without consideration for all the extra tips that come included, which easily add another $10-20 to the value of the saving. H20floss might not be a name you are familiar with, but there is no denying that you get a fantastic amount for your money and I would suggest the actual cleaning performance is similar. If you are happy to spend more and want the peace of mind, invest in Waterpik. If saving a few dollars sounds appealing and getting one of the best deals you can, then this certainly has you covered. I do believe you will be hard pressed to fault it, given what it offers. 5-110 PSI with "pause" position on handle----Choose your best pressure setting and push the sliding bar to the lowest setting to stop water coming out. Can I use mouthwash in the H2ofloss? 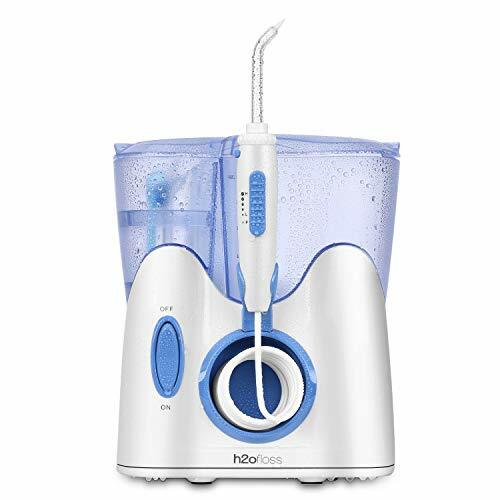 Do you own or have you used the H2ofloss Water Dental Flosser? I just purchased one and was on the web looking to see why there was a puddle on my sink after my first use . I wiped up water and dried off the bottom of the machine. There is a hole on the bottom and it looked like the water may have come out of there, not sure I will check next time I use it. The puddle wasn’t there when I finished using it, just noticed when I returned later there was a puddle. Thanks for commenting to let us know about this. If you do check again and the problem persists, please let us know so that others are aware. If you have any photos to share that would also be helpful.